Working together, helping you to succeed. At Actons, we’ve built a team of down-to-earth lawyers, who know that at the heart of providing you with exceptional service is listening and understanding what you want to achieve. We provide solution based, incisive legal advice – in plain English, so you can concentrate on the things that really matter. Having been in Nottingham for over 200 years, our long-standing reputation is based not only on providing top quality legal services – but on developing long term, mutually beneficial relationships. 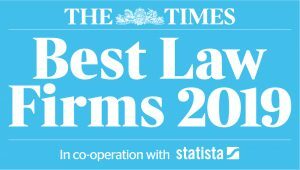 Not only are we included in legal directories, The Legal 500 and Chambers & Partners, but we’re also included in The Times Best Law Firms 2019. And that’s just a few of the reasons why we are Nottingham’s leading independent law firm.